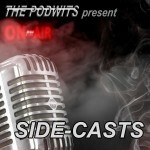 The Podwits bring your Part II of their Side Cast special exploring Batman’s 75th anniversary! Dion and contributor J. Blake continue on with memories of the Caped Crusader, and get into Tim Burton’s franchise versus Christopher Nolan’s, and also bring up what is going on the small screen by way of the amazing animated films D.C. Comics have been putting out in recent years. And how about the visual similarities between the cover art of Batman‘s first appearance vs. Spiderman‘s?! So come and have a healthy dose of the Dark Knight in part II of their tribute to Batman at 75! Here is artist and writer Darwyn Cooke‘s Official tribute to the Dark Knight in a Batman Beyond short. Dylan Baker was the superb actor Sam Raimi had teed up in his Spiderman trilogy to play the Lizard. Special thanks again to saxophonist and composer Matt Garrison for supplying us an original theme, & please check out his new album, Patchwork.